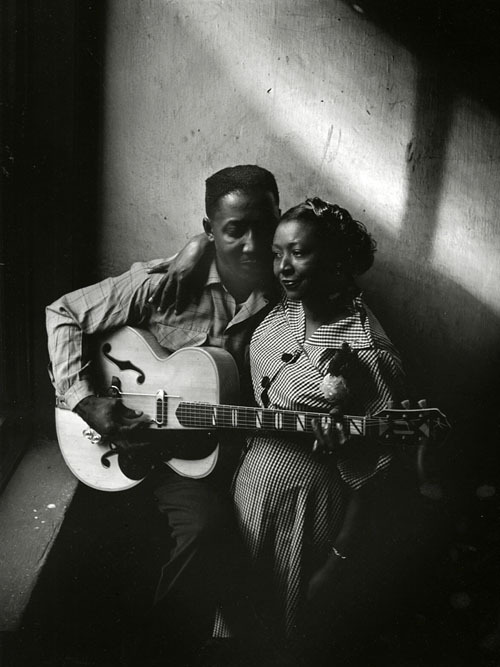 Muddy Waters and his wife Geneva in Chicago, 1951. Image copyright and courtesy of: Art Shay. Thanks to Paul Berlanga of the Steven Daiter Gallery. *** From our editorial director Alan Thomas: The 100th birthday of the great bluesman Muddy Waters arrives next April, but a recent encounter with an extraordinary (and previously unpublished) photograph of Waters prompts us to start the celebration early. It was made in Chicago in 1951 by photographer Art Shay, who himself celebrated a birthday this past spring—his 90th. Shay is a favorite of ours; his prodigious body of work includes the most memorable images we have of Nelson Algren’s Chicago. He shared his recollections of this photograph for us: “The editor of the New Yorker ended his review of the new Keith Richards book Life with a plangent line from Richards asserting he could never be as good as Muddy Waters or as black. I met the generally acknowledged Father of Rock and his wife Geneva in 1951. Time magazine had sent me to the south side club in which he was performing. I arrived early as usual and there he was, strumming his guitar and cuddling his woman in the hallway. Slivers of . . . Sometimes, especially during the month of August, I become a passive psychic channel for the erudition of others. The rest of the country heat-implodes; media denizens go on vacation; I begin and abort blog entries wherein I replace the names of the late medieval nuns from Craig Monson’s Divas in the Convent with characters from the 1980’s sitcom Murphy Brown. In the meantime, certain anonymous (not really: Hi, Ben!) Press purveyors of flash fiction rise to the challenge posed more than two years ago by certain other anonymous literary types (I C U JEFF WAXMAN): who can write the best bookstore heist story starring Parker, antihero extraordinaire, in less than 350 words? At the time, the winner took home a collection of 12 Parker novels penned by Richard Stark, all of which had recently been reprinted by the University of Chicago Press. 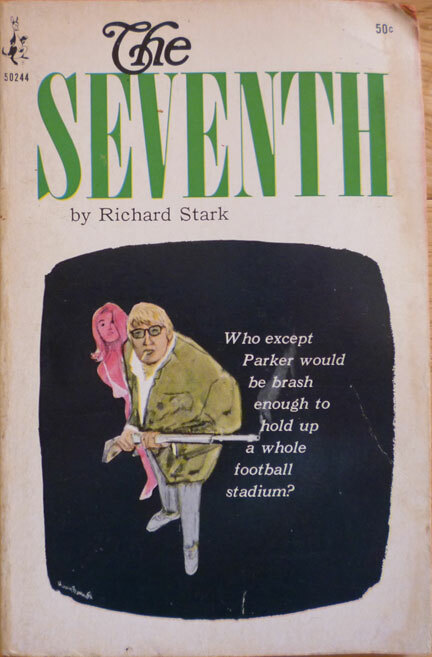 Because of my failure to assemble an animated GIF of Donald Westlake, our new champion Ben Balskus will win a prize no less credible—the below image of the U.S. paperback first edition of Richard Stark’s The Seventh, in which cover model Parker eerily resembles Gerard Depardieu. Congrats, Ben! Can’t wait to read your next piece on Green Card! . . .